In recent years, more and more computer users have begun using more than one monitor in their homes and offices. A dual monitor setup allows the user to effortlessly move between programs, work with multiple documents at the same time, and use other techniques to increase their productivity. If you’re thinking about adding a second monitor to your office, you’ll want to think about how you plan to set it up for best results. 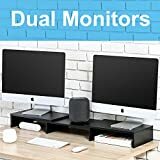 A dual monitor stand allows you to line up the monitors evenly, which will make it easier for your eye to track back and forth between the screens than simply putting two monitors on the desk near one another. Here are some ways to find the best stand for your office. Desk-mounted: Desk-mounted stands attach to the back of the user’s desk, which makes sense, since that is where the monitors, keyboard, and computer are, to begin with. Wall-mounted: Wall-mounted stands give users a bit more flexibility. Since they hang from the wall, users have more freedom to decide where they would like to put their monitors, so long as they have long enough cables. 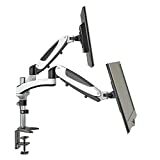 Articulating: Articulating stands—whether desk or wall-mounted—allow screens to move from side to side and sometimes up and down, which gives users greater control over their work experience. 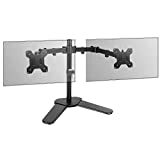 Sturdy materials: Monitors are expensive, so it makes sense that users want to be confident that their stands won’t give out and send their monitors crashing to the desk or floor. The best stands are constructed of materials that are strong, which gives owners confidence. 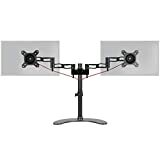 Ease of installation: Whether attached to the desk or the wall, it should be easy to set up the monitor stand, and then to attach the monitors to the stand. Great models set up in no time and don’t require a lot of technical skill to install. 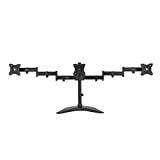 Adjustability: Not all stands allow users to move their monitors around, but for the ones that do have this option, it’s essential that the stand’s pieces move smoothly and steadily—this way it is easy and safe to adjust the monitors as needed. Monitors supported or attachment: Before investing in a monitor stand, make sure that it will work with your monitors. Even if the stand isn’t advertised as working with a particular brand or model, you should be able to find out how the monitors attach to the stand, which will let you know if you’ll be able to safely use the stand with your monitors. Size limitations: Check out the specifications on the stand’s webpage. Is it designed to hold the monitors you currently have, or are thinking of purchasing? 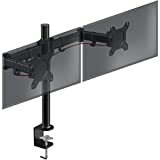 Mounting: As mentioned, monitor stands are either desk- or wall-mounted. Before purchasing a model, be sure to find out how the stand will be mounted in your office. Range of motion: If you are interested in an articulating stand, try to find out its range of motion so you can get a sense of how much (or little) freedom of movement a prospective stand will give you. 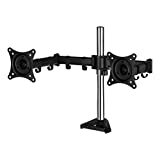 Easy Mount LCD: Easy Mount LCD is an American company that specializes in making monitor and television stands, along with other presentation equipment. 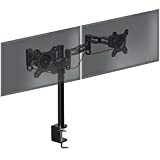 They offer stands and mounts for virtually every kind of screen that is currently on the market. 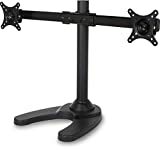 Mount-It: Mount-It is an American company that has been selling stands and mounts for electronic equipment since 2006. 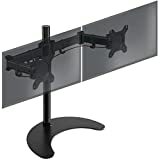 The company offers a variety of stands for computers and televisions, along with mounts for projectors, cables, and other accessories. Tyke Supply: Tyke Supply is an American company that produces monitor stands, desks, hand trucks, and other essential office equipment. Dell: Dell is a leading producer of computers and computer peripherals. Founded in California in 1984, today the company’s computers and accessories can be found in homes and offices around the world. 3M: Founded in 1902, 3M is an American company that is a worldwide leader in the production of office supplies and equipment. Today, the company provides individuals and businesses virtually everything they need to keep their offices up and running.